Diastasis Recti: Can you really close the gap? The answer is yes! It’s not all about closing the gap… but it can be accomplished with a combination of visceral manipulation (a gentle manual therapy that moves your organs) and strengthening the abdominal muscles. What is a Diastasis Recti (DRA)? It’s a separation of the two muscles that give you a six pack, Rectus Abdominis. 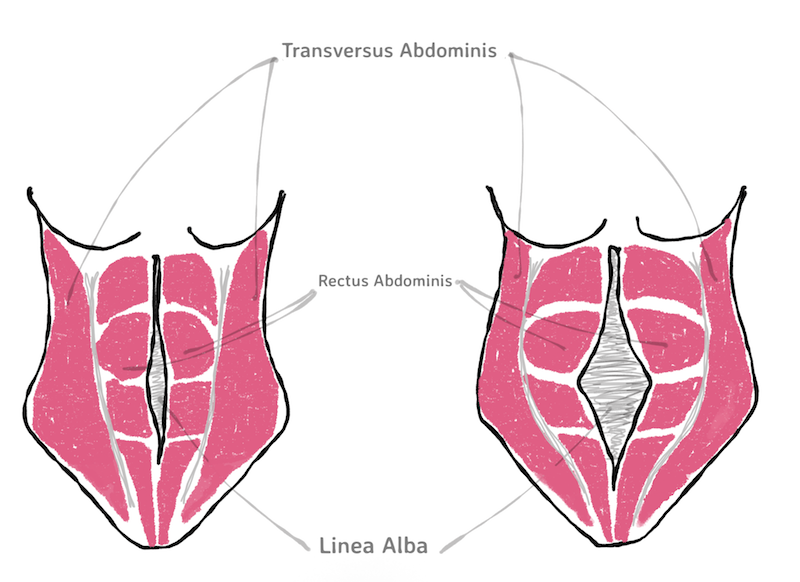 A little separation is normal and during pregnancy the line alba (fascia connecting all the abdominal muscles at midline) is naturally stretched to accommodate a growing baby. This fascia frequently becomes overstretched, leading to abnormal widening of the rectus muscles and loosing it’s supportive ability. Curious to know if you have a diastasis? This is a great self-check video. Don’t be alarmed if you do have a separation, it can be treated! The internet provides a lot of information that is both helpful and questionable. It is valuable to have a pelvic floor physical therapist fully evaluate your abdomen, ribcage and pelvis before you start an exercise program. How to treat a DRA? A recent case study series (kirk and Elliot-Burke, 2017) has suggested that restrictions of our abdominal organs and fascia attaching to the back, can cause a diastasis recti (8). This study only shows the immediate effect of the 2 exercises, so it doesn't give you permission to start doing crunches, but it does highlight that we shouldn’t avoid them! Coordinating the breath with correct TA and pelvic floor muscle activation, during a modified crunch is a safe way to rehabilitate diastasis recti… combine it with visceral manipulation and say goodbye to your gap! Rath A.M., Attali P., Dumas J.L., et al. The abdominal linea alba: an anatomo-radiologic and biomechanical study. Surg Radiol Anat. 1996;18:281-288. Diane, Lee Linda-Joy (Major Contributor), Vleeming Andry (Contributor), The Pelvic Girdle. An Integration of Clinical Expertise and Research. 4th Edition, Elsevier 2011.